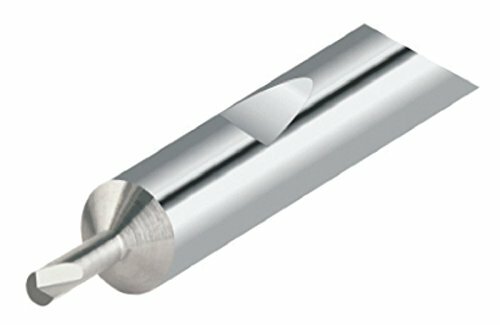 The MICRO 100 QMBB-070500X AlTiN - Aluminum Titanium Nitride coated, miniature, solid carbide, boring tool for utilization in the Micro-Quik Change Tooling System. Designed and engineered for most machining applications that requires boring/turning in small diameters. Tools can be utilized for both roughing and finishing. Manufactured with close tolerances to ensure ultimate precision and performance. AlTiN coatings are high performance and versatile. Has a higher breakdown temperature while maintaining high surface hardness at elevated temperatures. This type of coating also promotes tool life and allows for faster feeds and speeds. Excellent for dry machining applications. Applicable with oxidation temperatures up to 800° C or 1450° F. AlTiN coatings are best suited for alloy steels, stainless steels, tool steels, nickel alloys and titanium. The Micro-Quik Tooling System provides maximum centerline repeatability within plus or minus 0.0005" from tool to tool. When all of this systems components are used together, this unique system reduces machine setup, downtime, tooling costs, and tooling inventories all while boosting productivity. MICRO 100 Solid Carbide Tools feature more than just a micro-grain of excellent quality. Their substrate is in class of its own resulting from exclusive treating processes that allow increased speed and feed rates. For over 45 years, MICRO 100 is a known industry leader and internationally acclaimed when it comes to solid carbide tooling. View More In Profiling Inserts.